Book Now to Lock In an Amazing Low Price! 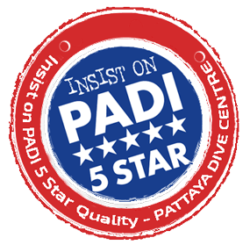 Its that Special Time of year again Where Pattaya Dive Center Offer NOT ONLY The very Best Service But also the VERY BEST PRICE! Book Your Dive Trip or combo 5 days in advanced for this amazing Special Offer! 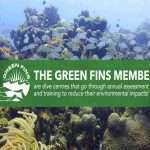 Calling All Certified Divers Looking To Go Scuba Diving in Thailand. 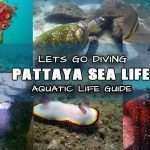 Come diving Pattaya! 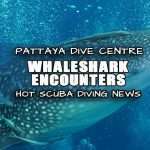 Whether you are an open water diver looking for some days out to cool off underwater exploring some nice reef areas or maybe your a Advanced Open Water Diver seeking out the thrills of Thailand’s best Wreck Diving? 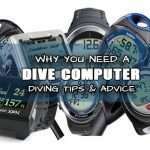 Book Your Fun Dives With Us and Pay Your Deposit Online 5 Days Before your Trip Commences We Will Include a FREE Dive computer rental with your dive equipment each day you book! 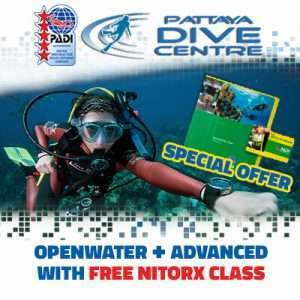 5 Day Dive Course Package Includes FREE Nitrox Class. Want your first PADI scuba diving license certification plus an extra boost to take you into the diving world with confidence and style? 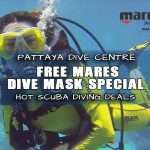 Come to learn to dive and go scuba diving with Pattaya Dive Centres Elite Starter Package. 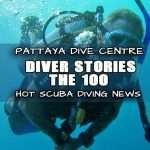 Our PADI Open water special offer allows you to take your Openwater License and your advanced openwater license and we’ll throw in a free enriched air nitrox specialty class for FREE worth 4000baht! 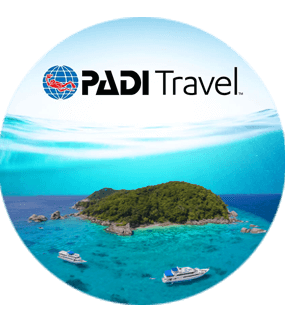 Our PADI Openwater Diver Course Elite Package is the best way for you to learn to dive and get the most beneficial experience introduction to the world of diving ever! 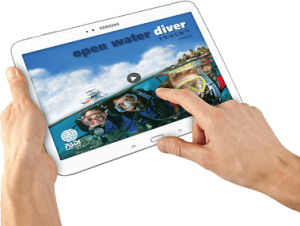 Over 5 days you’ll learn to dive as a Openwater Diver before getting onto the Advanced Diver Level straight away. 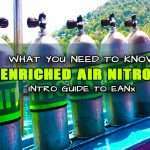 During this time we will also introduce you to the EANx COurse and you’ll also get certified in your First PADI SPecialty Course at the same time! *Term and Conditions* Book the Open water, Advanced and Nitrox course Combo and we wil give you the Nitrox class (Worth 4000thb) FREE. Please note Training manual and certification fee for Nitrox are not free. The Courses itself is FREE, the training manual / certification will be 2,690baht and is included in the package price. Lunch & Refreshments on Days of Diving. 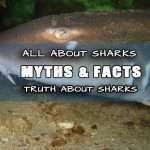 We must let you know that certain medical conditions may prevent you from scuba diving such as asthma and heart conditions. If you are currently taking any medications, or are unsure about your fitness to dive, please have a look at the Diving Medical Questionnaire. 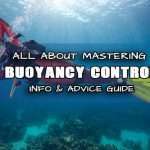 If you answer YES to any to any questions listed then you must print out the RSTC Medical form and take it to your physician to sign off prior to diving. RESCUE DIVER, EFR & O2 PROVIDER COMBO SPECIAL OFFER! 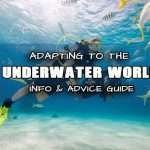 Looking for the Ultimate Rescue Diver Course?! Our Diver Medic Combo special offer is just for you! Book your Rescue course together with your Emergency First First and ask for the O2 Provider specialty course also and you can get a massive saving combo deal! 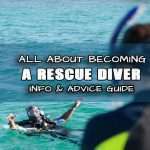 Becoming a PADI Rescue DIver is a crucial point in your diver education! 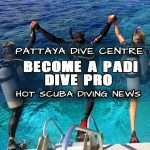 Here at Pattaya Dive Centre, we run a Rescue Diver package that produces the finest Rescue Divers out there! In combination you’ll learn Emergency first response skills, CPR, AED and more plus explore the finite aspects of what makes an excellent Rescue diver including the proficient knowledge of o2 use in diver emergencies. 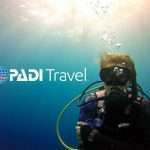 MULTI DIVE SCUBA DIVING PACKAGES! 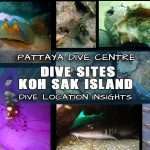 Here are Pattaya Dive Centers Multi-Dive Combo Packages for Certified Fun Divers! EXTRA VALUE! You when book any of our Dive combo packages above, along with the savings of the combo packages, if you book AND pay deposit 5 days before the trip begins you will ALSO be entitled to the below FREE DIVE COMPUTER RENTAL SPECIAL OFFER, giving you a free dive comp to use each day of your dive comb package!